For whatever reason when people get married these days, they often like to capture fun imagery of themselves as children. When planning out our wedding video and other details, I found two photos of us at about the same age. My Mother-in-Law says hubs is actually a year younger than me in the photo, which is okay. I love my younger boys. He's three years younger than me. My high school boyfriend was one year younger than me and my college boyfriend, two years younger. Strange progression now that I think about it. Basically all men born in 1972 were just bad eggs, I guess. On my wedding website, I had these images along with current pictures of us. A woman commented or emailed me, I forget... asking if "they" were my children. Odd, the photo looks rather '70s to me. That would make me my parents age. Do I look 60ish? Geez. I'm visiting from Teaching 4th grade. I think whoever asked if those were your children must have been smokin' somethin' because yeah - totally 70's. But I'm amazed yours still have color - mine have faded to a nice orange. I think a composite of what your kids would look like, is in order. I love photos from the past! I found you from blog hopping. :) Nice to meet you! How adorable!! Love the photos. That is pretty sweet and adorable. 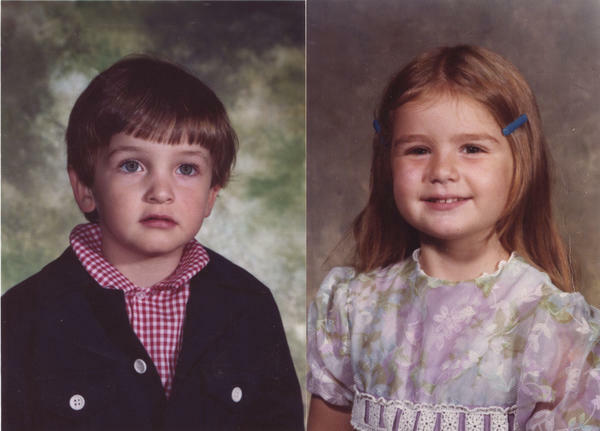 When I compare my wife's pictures and mine when we were kids, we look a lot alike. And then I think about when my kids act really strange and I wonder if I married like a 5th cousin or something. LOL Obviously the 70's..what a dweeb! I'm visiting from Teaching 4th grade too....and also in Jersey! Cool, huh?! Yep, the pics totally look 70's... great photographs though. Although I made a bigger faux pas at work once, asking if the pics on a coworker's desk were his kids (he was in his 50s.) One of them was his son, but the other was his much younger wife! Ahhh...more vintage photos. And so cute, too! If I were to post early pics of my hubby and I, I'd have to label them "Two geeks in a pod". Doesn't have to mean you're 60. Parents today take the darndest theme photos of their kids. You should see the technology at the Sears photo dept. You two are just adorable! I love old pictures! You're both sooo cute, and he looks so unsuspecting! You should have said yes they are! I'm actually 63, don't I look great! Look at the two of you cuties!!! I love looking back on old school photos. My brother and sister-in-law did that. They scanned old school photos and had a digital picture frame on the table with their guest book. Haha! Yes, 1972 I guess was a bad year. Thank goodness my husband was born in 1978. Whew! I'd have run with it, too. Maybe I'd have added in something like, "These were the school photos I had taken of them the day before their real birth mother claimed them." You guys were adorable. Oh, those cheeks of yours! Or like The Teach, I would have said something like, "Well, they WERE mine, but now they're missing children. Have you seen them?" How CUTE were you both!? I love this. I wish that I had had pictures of the hubs and I as children at our wedding reception, but I conveniently left them at home when we traveled out of the country for the wedding. Awwww! Look how cute you two are! We had a slew of old photographs of both me and Alan at our wedding reception. Alan was born in 1972 also. There is one particular photo with my Alan slumped over a station wagon in a "I'm a cool dude" sort of pose. It was very embarrassing for him (and me)!! OMG- i LUV these pictures of you two!!! i think i'm gonna do this next time i get married. Car on fire! Dial 9-1-1! Wanna Swim In My Pool? Is There An Ugly Ben? Five Secrets About Me... Family Members Keep Out!